The circus has come to town! Well… sort of. There's no elephant on a bicycle but there are the Greek Geeks and have they got a story or two to tell. More specifically, a myth or two: Pandora's Box, Persephone and the Underworld, King Midas, Athena and Arachne, and don't forget the Mythapalooza Slam Jam! 'Circus Olympus' uses comedy and physical theatre to tell the tales of some classic myths. 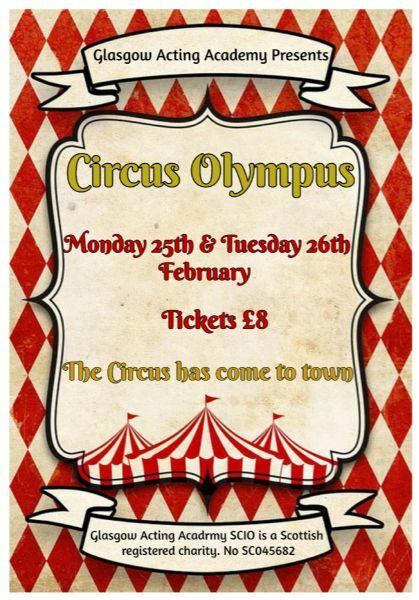 The circus comes to GAA on Monday 25th and Tuesday 26th February. Tickets are available from the office now!